High-D offers the possibility of loading data in various formats and from multiple data sources. The most common ways of importing your own data is to use tab-delimited orcomma-separated files, as well as Excel workbooks. Connectivity to common relational databases and some on-line data providers is also provided. or double-click on the file if its extension is registered to High-D. This is the native format used by High-D. It can be used to store both a copy of the actual data, its original data source, as well as all the configurations made using the High-D application. The data are stored in a highly compressed binary format to reduce the file size and all the configuration information in XML format. For a detailed technical specification of the data format, please contact us. Loading data from tab-delimited text files should be pretty straightforward. High-D expects the first line to contain the name of each column, using the tab character to separate each column. The tab-separated values format is a popular method of data interchange among databases and spreadsheets. It stores tabular data (numbers and text) in plain-text form. While it is a loosely defined format (even though IANA attempts to standardize it), High-D automatically detects its encoding, the type of data values, and handles smoothly all the most common causes of errors. Tab-delimited files are processed similarly to comma-delimited files, except that they use the tabulator character to separate each column. High-D expects the first line as a header to contain names corresponding to the columns in the file. These values will be used to name each of the variables. Each record is then located on a separate line. The values between each column are delimited by tabs. Each record "should" contain the same number of tab-separated fields. Any field may be quoted (with double quotes). Fields containing a line-break, double-quote, and/or tab should be quoted. A (double) quote character in a field must be represented by two (double) quote characters. After the file has been loaded, High-D will attempt to detect the data type of each column. Automatically recognized types are text (String), numbers (Integer and Double) and some more specialized types such as dates (supported formats are "MM/dd/yyyy", "MM/dd/yy", "yyyy-MM-dd", "dd.MM.yyyy HH:mm:ss"), URLs, geometries (in WKT format), and binary data (in Base64 format). While High-D will autodetect the character encoding used for representing international and special characters beyond ASCII characters, it is recommended to use the Unicode standards (typically UTF-8 or UTF-16). To force High-D to parse values for a specific data type, an optional second header line can be inserted. The second line can optionally contain information about the type of values to be expected for each column. Possible types are "String" for any type of textual information, "Integer" for numbers without a fractional or decimal component, "Float" and "Double" for single and double precision floating-point numbers, and "Color" to provide color information. Each subsequent lines should contain the respective values for each of the columns. As an example, you can download the Forbes Global 2000 dataset in this format. After the data file has been loaded into High-D, it will automatically attempt to create a default configuration. The comma-separated values (CSV) format stores tabular data (numbers and text) in plain-text form. 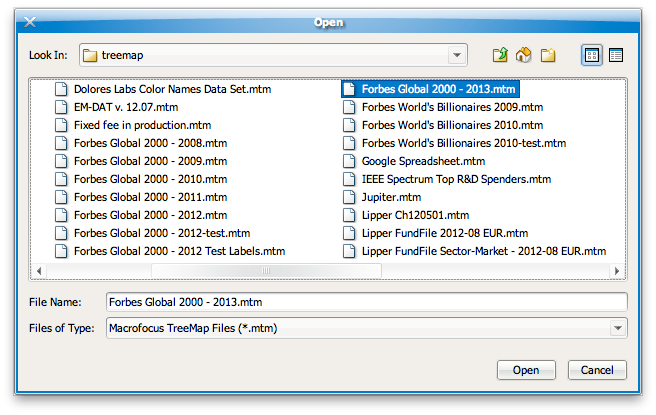 Most spreadsheet and data management software are able to export data in this format. While it is a loosely defined format (even though RFC 4180 attempts to standardize it), High-D automatically detects its encoding, the type of data values, and handles smoothly all the most common causes of errors. Comma-delimited files are processed similarly to tab-delimited files, except that they use a comma (or semicolon) to separate each column. High-D expects the first line as a header to contain names corresponding to the columns in the file. These values will be used to name each of the variables. Each record is then located on a separate line. The values between each column are delimited by commas (or semicolons). Each record "should" contain the same number of comma-separated fields. Any field may be quoted (with double quotes). Fields containing a line-break, double-quote, and/or commas should be quoted. A (double) quote character in a field must be represented by two (double) quote characters. To force High-D to parse values for a specific data type, an optional second header line can be inserted. The second line can optionally contain information about the type of values to be expected for each column. Possible types are "String" for any type of textual information, "Integer" for numbers without a fractional or decimal component, "Float" and "Double" for single and double precision floating-point numbers, and "Color" to provide coloring information. Each subsequent line should contain the respective values for each of the columns. High-D can read files produced by Microsoft Excel, including the recent Office Open XML format, even without having Excel installed on the local computer. The first row is expected to contain the name of each column. If the workbook contains multiple sheets, a dialog allows to choose which one should be loaded by High-D.
To force High-D to parse values for a specific data type, an optional second header line can be inserted. The second line can optionally contain information about the type of values to be expected for each column. Possible types are "String" for any type of textual information, "Integer" for numbers without a fractional or decimal component, "Float" and "Double" for single and double precision floating-point numbers, and "Color" to provide color information. Each subsequent line should contain the respective values for each of the columns. High-D can read files in the native OpenOffice and LibreOffice format. High-D can read files in the native SPSS format. High-D can read files in the native SAS format. This is a popular geospatial vector data format for geographic information systems (GIS) software. Shapefiles spatially describe features: points, lines, and polygons, representing, for example, water wells, rivers, and lakes. Each item usually has attributes that describe it, such as name or temperature. 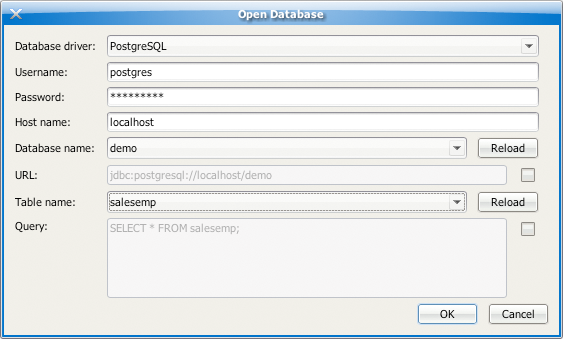 Access database tables can directly be loaded into High-D. However, this is only supported on the Windows platform and requires Microsoft Access or the Microsoft Access Database Engine to be installed. Please contact support if your database system is not currently supported. Any data source queryable through a JDBC driver can easily be integrated into High-D.
Microsoft Access is also supported, but as a file-based data source. Stock quotes data from Yahoo Finance can directly be access through the File → Open Dataset submenu, as well as all the example datasets provided on our website. This menu entry also provides integration withHigh-D Server. By default, High-D automatically assigns the first categorical variable to the label, the second categorical variable (if available) to the grouping, the first numerical variable to the size, and the second numerical variable (if available) to the color. Represents character strings such as "abc". Represents an array of character strings. Values should be delimited by commas. Represents a tagged string in HTML format. The short data type is a 16-bit signed two's complement integer. It has a minimum value of -32,768 and a maximum value of 32,767 (inclusive). The Integer data type is a 32-bit signed two's complement integer. It has a minimum value of -2,147,483,648 and a maximum value of 2,147,483,647 (inclusive). For integral values, this data type is generally the default choice unless there is a reason (like the above) to choose something else. This data type will most likely be large enough for the numbers your program will use, but if you need a wider range of values, use Long instead. The Long data type is a 64-bit signed two's complement integer. It has a minimum value of -9,223,372,036,854,775,808 and a maximum value of 9,223,372,036,854,775,807 (inclusive). Use this data type when you need a range of values wider than those provided by Integer. The Float data type is a single-precision 32-bit IEEE 754 floating point. Its range of values is beyond the scope of this discussion, but it can typically handle more than 7 decimal digits. This data type should never be used for precise values, such as currency. For that, you will need to use the BigDecimal type instead. The Double data type is a double-precision 64-bit IEEE 754 floating point. Its range of values is beyond the scope of this discussion, but it can typically handle more than 15 decimal digits. For decimal values, this data type is generally the default choice. As mentioned above, this data type should never be used for precise values, such as currency. An arbitrary-precision signed decimal number. A Double data type with support for formatting patterns. Represents a specific instant in time, with millisecond precision. The Color data type is used to encapsulate colors in the default sRGB color space. Every color has an implicit alpha value of 1.0 or an explicit one provided in the constructor. The alpha value defines the transparency of a color and can be represented by a float value in the range 0.0 - 1.0 or 0 - 255. An alpha value of 1.0 or 255 means that the color is completely opaque and an alpha value of 0 or 0.0 means that the color is completely transparent. When constructing a Color with an explicit alpha or getting the color/alpha components of a Color, the color components are never premultiplied by the alpha component. The URL data type represents a Uniform Resource Locator, a pointer to a "resource" on the World Wide Web. A resource can be something as simple as a file or a directory, or it can be a reference to a more complicated object, such as a query to a database or to a search engine. More information on the types of URLs and their formats can be found in the URL Specification. A representation of file and directory pathnames. Represents geometric information, such as points, lines, and polygons.